Do you have questions about rumors or stories you've heard about SGI? Write me. I may include a Dialogue/FAQ section on this site. If I don't know the answer (and that's entirely possible!) I'll find someone who does. I practice Buddhism within the community of believers that is SGI and I got tired of reading misinformation about SGI. What's the remedy for that? Only the clear clean light of truth. SGI represents the common mortals of this world. Aligning yourself with the people and advocating that all people are worthy of respect — that's a very revolutionary act. Anyone doing that is going to have a lot of powerful enemies among the powers-that-be in this world. We cannot allow religious or political authorities or agents of the mass media who look down on the people to go unchallenged. It is only natural that if we truly love our organization, we will feel anger toward those who unfairly attack it and be ready to do everything in our power to rebut their accusations and set the record straight. Those who fail to take such action succumb to cowardice and a selfish desire to look out only for their own welfare. "It is a time when many different sutras and teachings spring up here and there like so many orchids and chrysanthemums, when the various sects command a large following and enjoy renown, when truth and error stand shoulder to shoulder, and when Mahayana and Hinayana dispute which is superior. At such a time, one must set aside all other affairs and devote one's attention to rebuking slander of the Law. This is the practice of shakubuku." Now is the time for shakubuku. 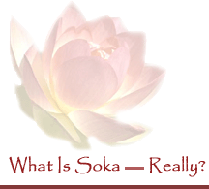 Soka Gakkai International (SGI) is a Buddhist association with more than 12 million members in 190 countries and territories worldwide. For SGI members, Buddhism is a practical philosophy of individual empowerment and inner transformation that enables people to develop themselves and take responsibility for their lives. As lay believers and "engaged Buddhists," SGI members strive in their everyday lives to develop the ability to live with confidence, to create value in any circumstance and to contribute to the well-being of friends, family, and community. The promotion of peace, culture, and education is central to SGI's activities. Why would anyone want to tear down SGI? I don't know. I do know that we live in a time of delusion and distraction. I'm taking action here to provide some answers.